If last few years seemed like 3rd parties focused heavily on combiners, it seems this year has become about the Dinobots as at least three or so companies are prepping their own Dinobot homages. In that realm we have galleries for not Computron, not Swindle, not Sky-Byte, and early look at the not Throttlebots combiner. On the official products front, Takara is working on their take of the Sega Genesis Transformer and a new paint job for Evasion Mode Prime. Hasbro has released images of some of their Angry Birds Transformers line and a look at some TF4 exclusives. 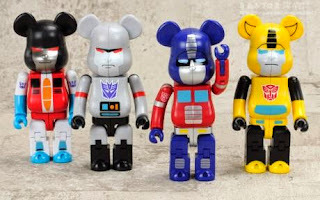 In the licensed products realm, Hot Toys is releasing their take on Optimus Prime while Prime 1 Studio has movie inspired busts in the works along with a large and expensive Starscream statue, and Kubrick is releasing their own Bearbrick Transformers. In addition have a look at apartments that kind of transform through creative use of space. On the review front, a look at 28+ toys that have been released or about too. A few favorites include a look at Generations Jetfire, iGears new design of the Seekers, not Skullcruncher, Guardian, not Sludge and a Dinobot combiner. 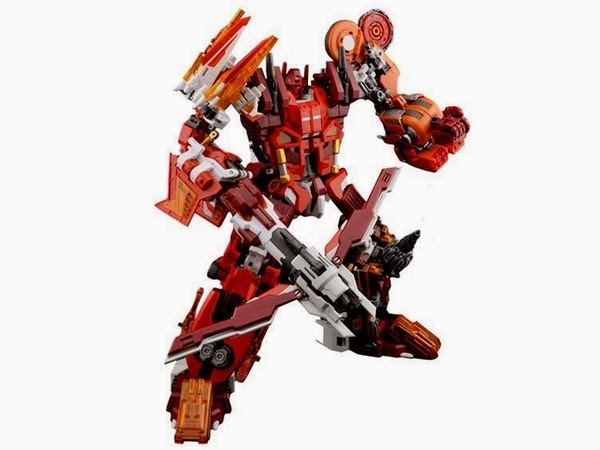 Quantron | Metal Storm - A five-figure set for 3rd party version of the Technobots that will form not-Computron. The core figure is Metal Storm (not Scattershot). Reviews of two of the limbs are below. The box set of the combiner will set you back around $430 when released in September. Warbotron Sly Strike - The third of five unofficial Combaticons with a Swindle homage. The result is a great homage. The toy is out now for around $90. ToyWorld Throttlebot Combiner - For more or less the last two years ToyWorld has slowly been releasing their version of the G1 Throttlebots but unlike their G1 counterparts, this 3rd party version of six bots will combine. 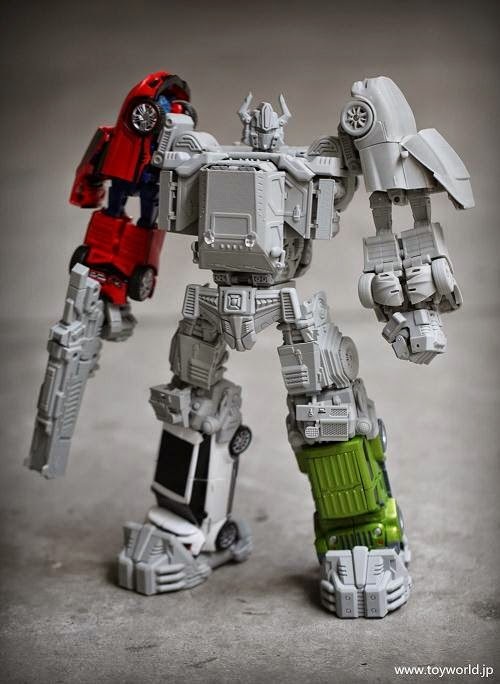 Hit the link to finally view the last three bots and the prototype of the combined figure. Still no release date though on the last bots. Toyworld Dinobots - Planet X is working on a line, FanToys has released their first one, Fansproject is about to release theirs (review below), TFCToys handed off their Dinobot combiner to another company (review below) and now ToyWorld has previewed their first two releases of not Snarl and not Sludge. So if love the Dinobots, the next year or so should be exciting. 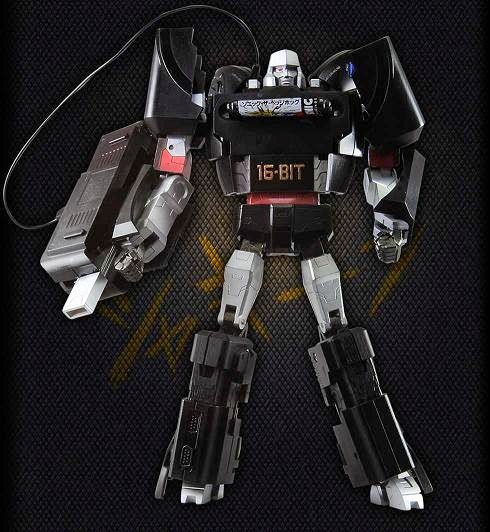 Megatron Mega Drive - An interesting upcoming release from Takara-Tomy that gives the Sega Genesis system a Megatron alt mode. No release date or price. They are also planning a Playstation One with Prime alt mode. Angry Birds Transformers - A first look at the new toy line that merges Angry Birds with Transformers. In general these seem to be the oversized Birds heads with TF-like look attached to a bot body that folds into a vehicle mold. Angry Birds fans may like it, personally it just looks like a waste of money to me. Milk Magazine Evasion Mode Optimus Prime - Another repaint of one of the better toys from the TF4 toy line, this is an exclusive to Hong Kong's Milk Magazine that looks very good with its rusted look combined with Prime's G1 colors. Much better than the white version. Transformers 4 Platinum Edition Exclusives - BigBadToyStore has revealed their upcoming shared exclusives (with Toys R Us). These include a Dinobots 5-pack with a gray deco, 1st Edition Prime with Trailer (that looks like MP Prime trailer repaint), Autobot 5-pack with improved deco, and leader class 2-pack with Optimus Prime and Grimlock. Currently no pricing or release date. TRU Masterpieces: Masterpiece Prowl | Masterpiece Sunstorm - Both of these are available to order on Toys R. Us. 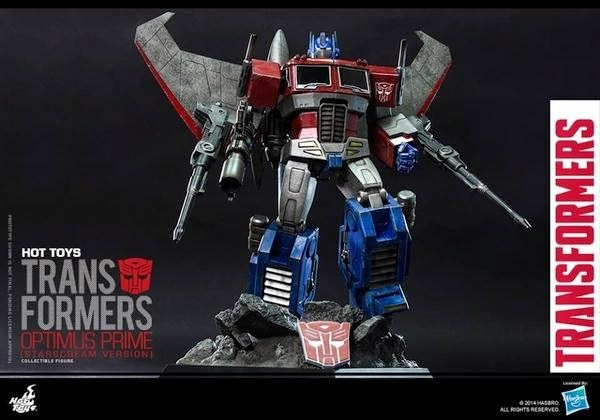 Hot Toys Optimus Prime (Starscream Version) - At the link is a look at a new toy for Optimus Prime that is a non-transformable action figure of Prime with Starscream's wings by Hot Toys. If not familiar, Hot Toys makes premium action figures that are high on detail with quality paint jobs and articulation. Basically they look like high end statues but you could technically play with them but with the average price point of $200-$350 I would imagine most do not. They are also planning a Optimus Prime using Megatron's arm cannon. No idea on price or release date. Prime 1 Studio TF Movie Busts: Optimus Prime | Megatron | Starscream - These busts are for individual display or can be swapped out for the Prime 1 statues for each figure. Not sure on price or release date. 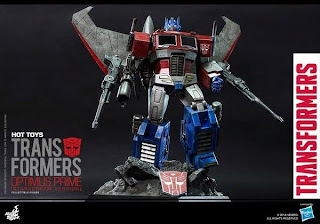 Prime 1 Studio Starscream Statue - To go with the above bust is this $1,750 (not a typo) statue of the movie version of Optimus Prime. The expensive Prime 1 Studio statues are gorgeous but can't help but wish they had made Transformers not based on the movie line (and at a don't need a bank loan to buy price point). Kids Logic Transformers 24k and Silver Plated Editions - Hit the link to look at two very limited editions of Kids Logic Transformers line that gives the figures a gold or silver plated figures. No idea on price or release date but imagine it will be very expensive. Still the pics are interesting to look at. Kubrick Bearbrick Transformers - The Bearbrick line is now being extended to cover Transformers where the little bears get a paint job that looks like various G1 Transformers. Of note is they do transform into a more G1-like robot. 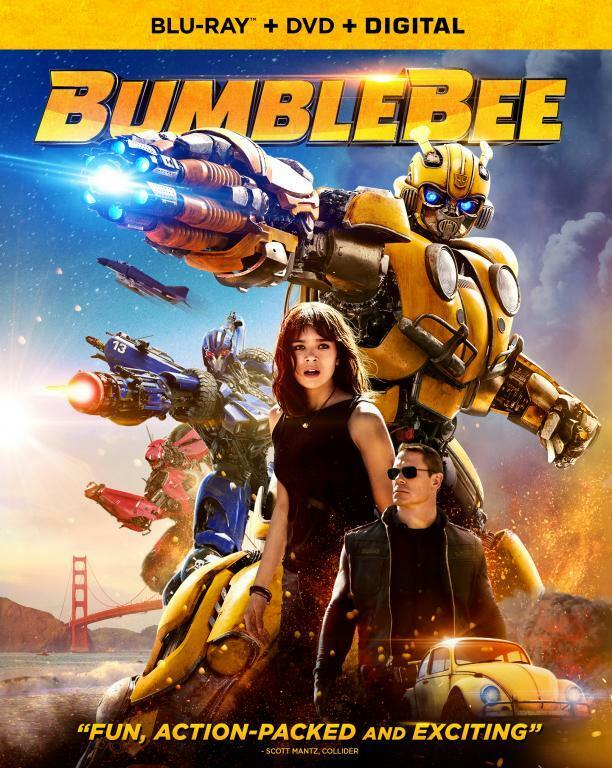 The first wave will be Optimus Prime, Bumblebee, Megatron and Starscream. Sadly these little robots do not come cheap with a price tag of $55 each coming sometime this month. Legacy of Revoltech Optimus Prime - This is a re-issue of an Optimus Prime non-transformable action figure from I think around 2006. Mine is sitting in storage and while not bad looking, for the price tag of $100+, its one of those hobby buying decisions you look back on and go "what was I thinking?" Still hit the link to view and see if might be interested. Transforming Apartments - Hit the link to view videos of an apartment in New York and another in Hong Kong that uses a whole lot of ingenuity to maximize the space of their tiny apartments. The key tricks seems to involve making maximum use of wall space as cabinet space rather than buying space taking furniture for the same purpose. Another aspect is to use all the waste space of furniture for other purposes like adding a drawer. Essentially everything is designed with more than one purpose in mind. For the crafts-people out there, it might toggle a few ideas. 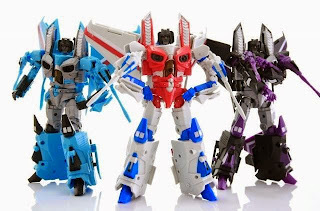 iGear Con Air: Star Burst | Thunder Wrath | Elegy - These are iGears new take on the Seekers with the reviews being for non Starscream, not Thundercracker and not Thrust. Like usually they are all essentially the same mold with small tweaks for each character. At a cost of around $100 each, I probably wouldn't buy all six, I am giving though to buying at least one as the mold is pretty sweet. Custom Robots Sunny and Jackie - Review of two Revoltech like non-transformable action figures that are not Sunstreaker and not Wheeljack. The result is actually very good homages. Available now for $90 at ToyDojo. Maketoys Quantron: Blindfire | Celeritas - Two of the five figures that will make up their non Technobots line. As mentioned above, the full box set of five should be out sometime next month. I couldn't help myself and went ahead and pre-ordered it. Which is also why had to pass on some of these other awesome upcoming releases. Mastermind Creations: Azalea | Leo Dux | Talon - Azalea is another 3rd party take on Arcee with an alt mode that homages her G1 Cybertronian mode but definitely not the same. Leo Lux and Talon are the next two figures in their non-Predacon line as they near completing the set. Azalea will be out sometime in the fall for around $60, Leo is $125 (out now) and Talon is $95 for a maybe August release. Mech Ideas: Gauntlet and Piston | Bluster and Trench - These are their take on the Transformers: Animated toy line with that exaggerated animated look. No idea what characters they are homaging as not got into the series but fans might want to give the reviews a look. For Super Mario fans, the homage by Bluster and Trench is intentional. Bluster and Trench are out now for $30 each, not sure about where to get the Super Mario homages. Perfect Effect Guardian - A repaint of one of the best 3rd party releases of 2014. 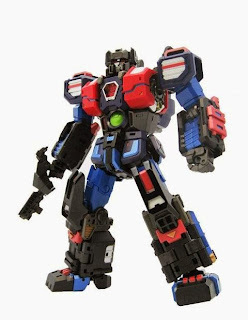 The 3rd party head of G1 Fortress Maximus gets repainted in his black and orange color scheme that was used for Korea and other repaints. While the tank mode continues to blow, there is no ignoring just how beautiful a robot design and paint job the figure has. If it wasn't for its $160 price tag, I would be really tempted to get this repaint just on looks alone. ToyWorld Swamper - The main reason for the delays in the Throttlebot combiners seems to be that ToyWorld shifted their focus to their headmaster line (probably due to Fansproject Function X line of headmasters). Their latest release is their take on Skullcruncher and in quality aligns with the rest of their pieces. While the Fansproject take is sleeker and better, for some reason I just enjoy getting these G1 homages too. Warbotron Heavy Noise - The second figure for their not Combaticons line with not Brawl. The result is pretty solid and personally I am looking forward to what I hope is a well priced 5-pack of the figures when all of them are released. Price is $90 and out now. KFC Sencho Barbossa - A 3rd party Sky-Byte that comes with a stand for the shark alt mode. Overall not a bad a bad figure but personally not a fan of the blue and red color scheme. KFC tends re-use their molds in a way that only Hasbro would be proud of with what seems like an average repaint per mold being around five+ so if don't like the color scheme, just wait they might release one you do like (a purplish one called Haiku has already been announced). Barbossa is out now for around $90. Hasbro Generations: Voyager Roadbuster | Deluxe Windblade - A look at upcoming figures including the "fan designed" (a bit of an exaggeration) that already got her own mini-series from IDW. Both figures are excellent additions to the Generations line and hoping will be on toy shelves soon. 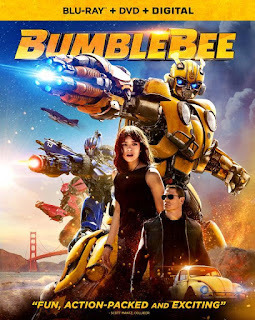 Age of Extinction: Kre-O Galvatron Battle | Deluxe Lockdown | Evolution of Bumblebee Set | Deluxe Drift - More reviews of upcoming releases of the line. Not sure when will hit toy shelves. 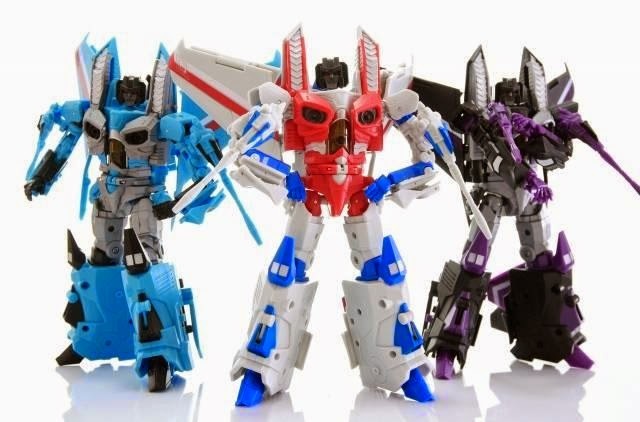 Generations Jetfire - A first look at the leader class figure that is set for release maybe in September. The result is a very solid Transformer that I suspect will be very popular with G1 fans. You can pre-order the figure from Amazon now for $45. Deca Toys Kronos - Essentially a 3rd party version of Masterpiece Skyfire that looks like he was directly lifted from the G1 cartoon series. Visually he is a great looking toy, especially for the cartoon fans but as the review shows, he has a clunky transformation and quality control issues. A fine first effort from the company and hopefully a learning experience that will be applied to future releases. Out now for around $200. Fansproject Columpio - A first release of their new Exo-Realm series starting with not Sludge. The review below is for a chromed TFCon exclusive while the regular edition will not be chromed. Personally I have learned to just hate chrome as results in fragile pieces and shows scratches too easily so all for a non-chromed version. Any case as review shows, there is a reason that Fansproject is considered the best 3rd party company. The retail version will be released sometime this month for $103. Sirtoys TFC Star Cats Dinosaur Team - This one is an interesting creation. Based on designs by TFC Toys but made by another company. The result is a decent set of toys that are pretty cheap at a price of $70 for all five but as the review shows with that cheap price does come quality issues. Still compared to most 3rd party releases it is a bargain especially since a Dinobot combiner. Kids Logic Transformers - A look at Kids Logic non-Transformable mini-figures. They actually are cut and look very good but to me not worth the $120 price tag. That is correct. Thrust is a cone head with Dirge and Ramjet.